Creator Pro is a good printer not just for those who are serious about 3D printing, but for those who are serious about it for the long run, as it supports many kinds of filament types. Having two extruders adds a lot to what can this 3D printer do, like the ability to print objects with two colors, or using 2 kinda of materials. Or both. Since it supports the popular Sailfish firmware, you will be able to do much more with it for no additional cost. And in short, it is one of the best 3D printers I reviewed so far. Having two extruders makes it possible to print in two colors, or to use two filament types. You only need to adjust 3 screws to level the printing bed. Which makes things easier. 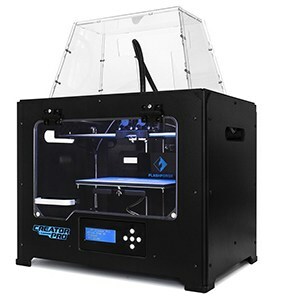 Supports the popular Sailfish firmware, which adds more functionalities to your 3D printer. Compatible with Linux operating system. The instructions are not very detailed (But that’s not a real issue, given that there are unofficial instructions you could use out there). Compatibility: Windows, Mac OSX and, Linux. 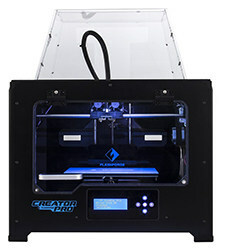 Creator Pro is an enclosed printer, something that can help with printing with using ABS filament type, as well make it safer to use in case you have children. There are some assembling you need to do before you could use this 3D printer, but that part is not very hard with the right help (more on that later). It also has a metal fame which makes it a more stable printer. On the bottom of Creator Pro, there is an Inverted LCD screen, which you can use to print files directly from the SD card, load filament, home the axis & few more things. Creator Pro has an internal power supply, so you won’t have to deal with a bulky power brick when you move it around. Now let’s talk about setting Creator Pro up, don’t worry if this review contains some additional details of what you will face if you purchased this printer. The goal from this is to help you know what you could face with this printer. Which could make or break your decision to buy it. While I expect 3D printing to become much easier over time, tinkering is still an important part of the game. Which is why I don’t recommend getting a 3D printer if you are not up to that, as even the easiest to use printers out there will require you to at least to tighten a screw or something. The first thing you need to know about setting this 3D up is that it comes with its voltage set to 230V. If you live in Europe, then that’s fine. But in case you live in the US, you will need to switch it to 115V. You do that by flipping a switch on the bottom of the printer, you will need a screwdriver in order to reach & flip the switch. After you remove all the packaging parts & the boxes inside the printer itself, which contains filament spools & other things, which you will need to do some assembly first. Creator Pro comes with additional nuts & screws, so you won’t to use all of the, this is a very additional welcome. You may want to keep these additional parts in case you needed them later. Leveling the printing bed (build plate). The instructions manual (found on the SD card, along with the software & sample prints) contains steps on how to do all these. And what is even better. Some people at 3duniverse.org did a great job of making a more detailed unofficial manual for it, which you can access by clicking here. The unofficial manual contains leveling instructions in two difference ways. As well as details on how to use various 3D software, like Slic3r, Makerware & Simplify3D. Along with explanation on how to solve many issues. Many 3D printers come with the printing bed leveled, but I advise you to level it yourself despite that, as the leveling could have been ruined during shipping. While I won’t cover how to level the printing bed in this review, there is a very nice to point out about leveling Creator Pro’s bed:- To level the bed, you only need to adjust 3 screws (or knobs, which you can see in the picture on the side), which makes the process much simpler compared to many other 3D printers. Creator Pro feature very good printing quality. The supported layer thickness (or layer height) ranges from 0.1 mm to 0.3 (or 100 to 200 micron). Layer thickness, or accuracy as it is also called, determine how precise the print will be, the lower the layer thickness, the higher the accuracy, but the slower it will take for the printer to finish printing your object. You can see a demonstration of layer thickness with pictures by checking out this excellent article about it. One little note I want to make here that, unlike many other 3D printers, where the printing extruder moves in all directions to print your object. Creator Pro’s extruders only move in the X & Y axis, while the printing bed moves up & down in the Z-axis. PLA is made of corn starch, which makes it more environmentally friendly. When heated & melted, it smells sweet, as opposed to ABS, which smells bad for some people. PLA is less sturdy than ABS, but it requires less heat to be melted (For that reason, a heated printing bed is a must if you want to print with ABS). Since it cools down slower than ABS, the extruders should contain fans to help with that (Creator Pro has fans on both of its extruders). Besides PLA & ABS, Creator Pro also supports some other exotic 3D printing materials, like nylon & dissolvable filaments. So you will be able to expand your usage of this printer once you get good with the more common filament types. Most 3D printers comes with one extruder, with the ability to add a second one for some of them. Creator Pro comes with two right out of the box, each of the extruders take filament from one of the two spools on the back of the printer. The advantage of having two extruders is that you can print objects with two colors, and if you want, you can print materials using both PLA & ABS. 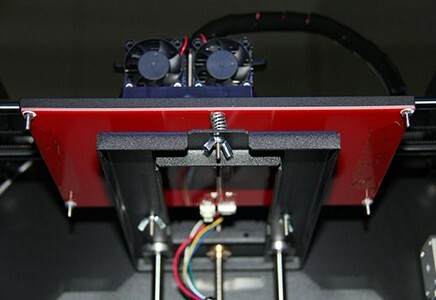 For example, if you want use support for your model(support is additional thin material the printer makes where the 3D printer can use to print the hanging parts of the model on, they are usually easy to remove once the model finish printing), you have the option for printing it with a dissolvable material that are easier to remove. If the second extruder got in your way of some prints, or in case you decided that you don’t want it, you can remove it and print with only one extruder. Much like most of the other 3D printers, Creator Pro allows you to print over USB port, or by storing the files in a SD card and print them from there. Also, the 4GB SD card that comes with the printer contains the manual, the software, as well as the sample print files. One of the greatest advantages of Creator Pro is that you can change the firmware & install a new one. Firmware is the internal software that operates your 3D printer. And just like any software, it has features that allows it to do a certain number of things. So installing a new firmware will allow you to increase what Creator Pro is capable of. Advanced printing features such as changing the printing speed and temperature while printing. The ability to repeat the same print without going through additional screens. Printing the same object twice using each of the two extruders, which will saves you a lot of time if you print the same object often. Adds support Toshiba AirFlash Wi-Fi card. Support for Core-XY and H-Gantry. The ability to install firmware like that adds to the value of owning Creator Pro, as you will be able get more for the same original investment you made in the first place. Creator Pro comes with ReplicatorG & MakerWare out of the box, but you can run other software with it, like Simplify3D & Slic3r.